Early on in Singham, there is a point at which Bajirao Singham’s fists send a villain flying. As the hapless man’s body rotates in mid-air, Singham takes a leap, lunges towards that body spinning in slow motion, and steps over him on his way to the next bad guy. It’s at this point that you must decide whether you are in the mood for a no-holds-barred fantasy action thriller or you wish to leave the hall. Singham is not everyone’s cup of tea – there’s too much in it that defies logic, gravity and many other laws of physics. But if you enjoy at least the occasional hero whose superpowers are not derived from the wizarding world or the bite of a spider but simply from the fact that he’s the leading man in an Indian film, do stay on – you’re in for a zany ride. Singham is the story of an honest policeman in a small village bordering Goa and Maharashtra. Bajirao Singham is loved by his people for the justice he metes out, relying more on the heart and human ties than legal procedures. This is a film about what happens when he crosses swords with the powerful criminal-politician Jaykanth Shikre. 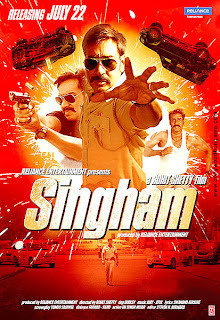 Singham is a remake of the 2010 Tamil superhit of the same name. The Hindi version does not have the incredibly handsome Surya in the lead, but what it does have is the incredibly intense Ajay Devgn whose searing eyes have always been an interesting contrast to his unexpectedly shy smile. In this film, he comes to us more muscular than ever before – those arms are a tad too bulked up for my tastes, but boy oh boy, do I envy him his abs! Devgn is pitch perfect as the straight-talking, kind-hearted Singham who single-handedly beats up entire gangs of goons, yet is shy in love. Providing a fabulous villainous foil to Singham’s goodness is National Award-winning Tamil/Telugu/Malayalam actor Prakash Raj as Jaykanth Shikre, reprising his role from the original Tamil film. Prakash Raj ups the ante here, his arrogance and ruthlessness several notches higher than in his Tamil avatar. Of the supporting cast, I particularly enjoyed the actors playing Singham’s colleagues. Kaajal Aggarwal playing Singham’s girlfriend may not be the most charismatic star you will find, but she’s pretty and bubbly and sadly, the role demands nothing much of her beyond being the woman behind her man. The film is filled with such 1970s style dialoguebaazi. My favourites are Shikre’s “sab kuchh karne ka, lekin Jaykanth Shikre ka ego hurt nahin karne ka” and the one I know I’ll be quoting for years to come, Singham’s “Meri zaroorte kam hai, isliye mere zameer mein dum hai.” It’s a line that made me want to chuck up my notions of dignity and whistle during the press preview. Despite the improbabilities inherent in this genre, make no mistake about this: Singham is masala with meaning. For me its lesson lies in the hero’s punchline: if your material needs are less, you’re less likely to feel the need to supplement your income through dishonest means, don’t you think? This is also an extremely intelligently crafted commercial entertainer designed to appeal to disparate audiences. When the hero seamlessly peppers his Hindi dialogues with Marathi, when he identifies himself as “Maratha Bajirao Singham” with a roar, I can just imagine the ferocity of the cheers in a movie hall in Maharashtra. As if Prakash Raj’s presence and the curiosity around the Hindi remake of a well-loved Tamil film is not enough to attract south Indian cinema buffs, there’s also an entire sequence with Tulu dialogues and a joke comparing a gigantic cut-out at election time to a “south superstar”. Singham also plays shamelessly to the gallery in an India disgusted and disillusioned with corruption. Which is why, I guess, despite my reservations about what seems like a justification of police atrocities in the film, I still couldn’t help but enjoy the leading man’s animal-like powers over his beastly bête noir. The action choreography is brilliant, a sort of mid-path between Amitabh Bachchan and Rajinikanth. The title track and the background score are a thumping tribute to the film’s larger than life appeal, though the romantic numbers didn’t work for me and it felt odd to see Devgn lip syncing to vastly different playback voices in two songs. It also feels odd to hear the hero’s girlfriend addressing him by his surname – I guess that’s the extent of the film’s keenness to convey Bajirao’s leonine qualities to us. 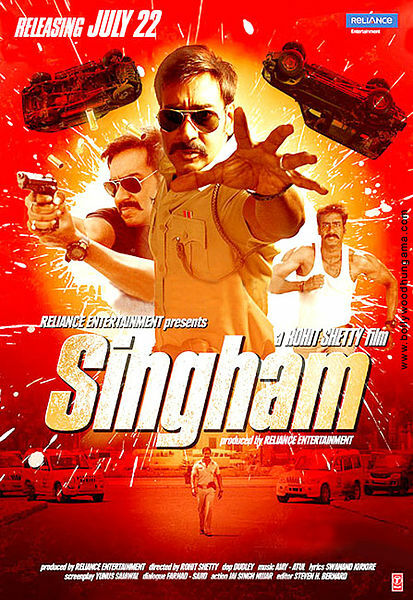 For a change Singham is a legitimate, above-board remake. But considering that a huge percentage of the film is a carbon copy of the original Tamil (with direct translations of dialogues and exact duplications of fight scenes) I wish the credits had been shared with the original writers and action designer. In creating a highly melodramatic vehicle for Surya, Tamil director Hari had shorn his film of the poignance that was so appealing in Kaakha Kaakha, an earlier highly memorable high-action cop saga featuring the actor and directed by Gautham Menon. Rohit Shetty’s version raises the drama several levels higher. On the downside then, Singham is formulaic and unrealistic. But its plus point is that it injects the formula with pulsating energy, making it a supremely entertaining watch. Congratulations Rohit Shetty! Prakash Raj has acted in a few Hindi films already, but I suspect that years from now we will look back at July 22, 2011, as the day when he well and truly arrived in Bollywood. Ajay Devgn has for years now been a major star but I suspect too that we will look back at this as the week when he finally became a Khan. the movie is great!!! loved it! ajay's action and dialog delivery was really wonderful and Prakash Raj deserves a special mention as the way he executes the negative roles with the comic punches is masterful!......... Reviewer, I completely disagree with your review. well crafted and honest review of the Singham. Better than any review of the film on the web.